Sorry for the english, the contact at your web suggested I try my question here. In 1971 I visited the Expo and have fond memories of sitting in a theatre type space with the opening above rising very high maybe 100+ feet with hanging chimes of some sort. Reminiscent of a large belfry type structure. As one sat, there was a performance of sound and I'm not sure of its origin but the effect was a very relaxed meditative type experience. I've looked your site all over and can't seem to locate such an exhibit. Hello Ben and welcome to the forum. Like I said in my email, I do not remember this event. But maybe one of our visitors remember that moment and I sincerely hope that you will get an answer soon. I don't know if there's a report between both, but in an advertising for Man and His World 1972, they talk about the Formoptic pavilion wich exemplifies the expansion of work of avant-garde artists here and takes the theme one step further in creative art with a film on kinetics. As all who visited the expo I have very special memories of a number of the exhibits. I will google any responses and see where it leads me. Thanks to any and all who may respond. Invité a écrit: Reminiscent of a large belfry type structure. I don't know if this will answer your question,but after Expo 67,a section of the former pavilion of Great Britain was transformed into a "beffroi de la musique". Here's a picture of this ssection in 1967. I think you may have it. I thought this may have been the place, but All refrences that I could find refer to the Britton exhibit as it was originally constucted. I will try and pursue the Brittish angle further. Music Belfry: The 200-foot tower is a place for music lovers. In a dim, cathedral-like atmosphere, a vast repertory of recorded music is presented. The program is posted outside the pavilion. The visitor finds not only musical pleasure but also serenity and relaxation. 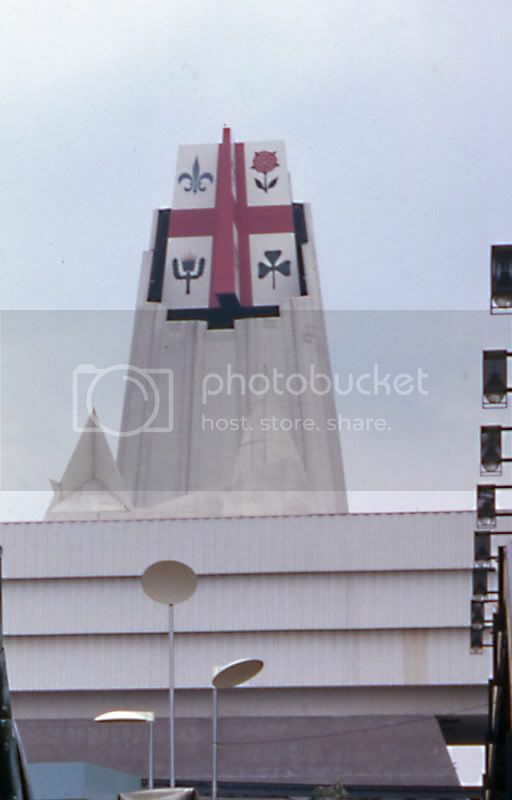 Invité a écrit: In 1971 I visited the Expo and have fond memories of sitting in a theatre type space with the opening above rising very high maybe 100+ feet with hanging chimes of some sort. Reminiscent of a large belfry type structure. This could also have been the Venezuela pavillion. One of the cubes had a series of tubes/pipes/rods that hung down from the ceiling, and that rotated at regular intervals.